Something new in Anniversary Update is UEV. Microsoft has moved it out of MDOP and put it into the operating system. Enabling and configuring it is pretty straight forward. First you need Enterprise edition to make it work. Don’t have it, don’t even try this, it won’t work. If you have the MDOP version installed on Pro, upgrading it disables it. Word of warning. You might think you are done. You are not, you have to enable the default templates. That’s all there is to getting this going. Default save location is the home drive for the user. So if that is defined in AD, you are all set. If not, you can use GPO to set the storage location. Your choice on how you do this. I’ve been running Windows 10 on my laptop since I got it 4 or 5 months ago. It’s a Lenovo X230 i5 12″. Nice and light and pretty decent. I picked it up used off of eBay from a refurbishing company. It’s been doing well but lately I’ve noticed that my WiFi just disappears after sleep or hibernation. A reboot brought it back until recently then nothing would bring it back. My LTE connection works though but WiFi was grayed out. Not sure why, but I figured this had to be a Windows 10 issue and not a flaky hardware issue. 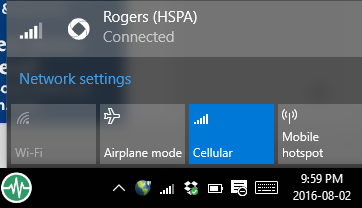 I guess when checking the network connections I was seeing it up and active, but I just couldn’t connect. Here is a lovely screen shot. You can see, I can still enable mobile hotspot, but WiFi is gray which made me wonder just what the Whiskey Tango Foxtrot was going on. I do what most IT people do now, Google for the answer. You will find quite a few hits on the issue http://bit.ly/2aE0rKE was the link I thought closely resembled my deal and it had a couple of suggestions. One suggestion is to run a reg delete which when ran just said the registry key couldn’t be found. The next step is to run netcfg, which again after running from the command prompt as admin, did nothing. Both commands just threw errors. I also disabled my firewall’s VPN software as the article indicated issues with older VPN client. I disabled the VPN client and rebooted. One of these two things fixed it up and allowed me to get WiFi fired up again. I don’t know which of the two things fixed it but I’ll update this post as I learn more about the solution. I am glad to have my WiFi back but I also want to ensure that I know what the root cause is for this problem. If you use a Palo Alto firewall, a new feature since PanOS 5.0 is the real time block lists. I’ve had a few people ask me how to set them up so here is the instructions. To know what the max number of IPs that your firewall can handle in the RBL, run the following command from the CLI. This will give you the maximum number of IPs you can have in the list. Next in the gui on your Palo Alto device, head to objects and then in the left, go to Dynamic Block Lists. Here is the list of block lists that I’ve configured. To create a new one, click on the add button and give the list a name and a web source for the list. Decide how often you want it to update. Finally you need to create a deny rule blocking these sites inbound. Commit the changes and you are off to the races. I often will leave logging on for a bit to see what is being blocked, but eventually, I turn it off because I don’t really care what traffic I am dropping. Here is a list of sites I pull in. It appears some of these might be managed by a Palo Alto engineer, but I am not certain about this.